A UMNS Report By Kathy L. Gilbert and Linda Bloom April 27, 2012 | TAMPA, Fla. The Rev. 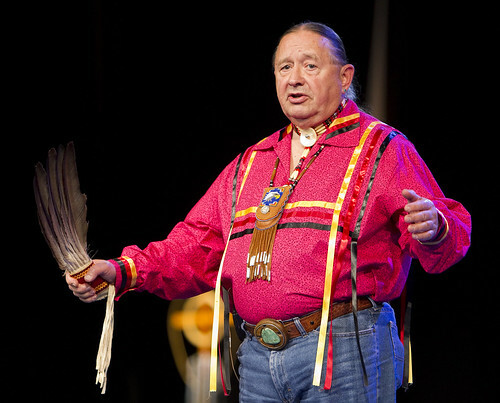 George Tinker helps lead an "Act of Repentance toward Healing Relationships with Indigenous Peoples" at the 2012 United Methodist General Conference in Tampa, Fla. A UMNS photo by Mike DuBose. Click on image to enlarge.View more photos. View video: George Tinker, Act of Repentance. If United Methodists are serious about repenting for past injustices against native peoples, they must prepare for a long and painful journey, says a Native American theologian. "There is a lot of history that has been concealed; you have to go and dig it up," said the Rev. George "Tink" Tinker. He and indigenous representatives from the U.S. and other lands brought that message during an "Act of Repentance toward Healing Relationships with Indigenous Peoples" April 27 at the 2012 United Methodist General Conference. The sounds of native music a didgeridoo used by indigenous Australians, a flute and the sounds of nature greeted worshippers as they were asked to gather in silence. Harry Askin, a board member of the United Methodist Commission on Christian Unity and Interreligious Concerns, which led the planning for the Act of Repentance, expressed what some in the crowd might have been feeling. He said he intellectually understood the need to repent about the injustices against indigenous peoples long before he felt an emotional and personal responsibility to do so. "We must acknowledge how important repentance is to the people we have hurt," he said, "And make turning around our personal commitment." Tinker expressed his respect for United Methodists having the courage to engage in the process of repentance. He realizes, he said, how hard it is for white people to know the true history of America. "It doesn't get taught in our schools, Native Americans have to learn it in our homes from our parents and grandparents." Standing alone on the stage holding a traditional feather fan, he told story after story of Native Americans being hurt in the name of Christianity. One particular dark spot in United Methodist history is the Sand Creek Massacre. A Methodist pastor was ordered by a Methodist governor to kill more than 160 mostly women, children and elderly at Sand Creek. The massacre occurred a month after the Native Americans surrendered. "That is the history we have to deal with," Tinker said, "Not just Sand Creek, but Christian conquest of North America." What will it mean to repent? he asked. True repentance will mean a change in lifestyle. "The first words Jesus speaks in the Gospel of Mark is for repentance. Repentance is a process you do again and again and again. It's a process you live out of." 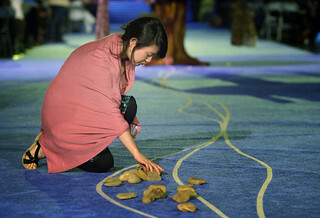 A delegate picks up a stone in the center aisle during an April 27 "Act of Repentance toward Healing Relationships with Indigenous Peoples" at the 2012 United Methodist General Conference in Tampa, Florida. A UMNS photo by Paul Jeffrey. Click on image to enlarge. The Rev. Anita Phillips, director of the church's Native American Comprehensive Plan, said her greatest fear is her brothers and sisters in The United Methodist Church will turn their backs from the painful history and continue to do harm to Native Americans. She said it would be "intolerable" if this act of repentance led to more pain. "It is my great hope European Americans will not turn from this moment." Other stories came from Otto Braided Hair, a descendant of survivors of the Sand Creek Massacre; Gladys Mangiduyos, Wesleyan University, Philippines; the Rev. Beauty Maenzanise, dean of the faculty of theology at Africa University; and Rev. Yngvar Ruud, a pastor in Oslo. Four representatives of the United Methodist Council of Bishops shared the council's own statement of sorrow and commitment to repentance. "We are here to commit ourselves to addressing the wrong and asking for the forgiveness of those who have been wronged by failing them so profoundly," the statement said. "We confess to God, acknowledging our guilt, resolving to cease the harm, pledging ourselves to live differently, reversing the damage that has been done through our participation in violence, maltreatment and neglect of Native and indigenous peoples so that we may bring about healing and restoration to all."